Starting a Code Club #piday #raspberrypi @Raspberry_Pi « Adafruit Industries – Makers, hackers, artists, designers and engineers! …In the first Code Club meeting, the volunteer talks the club (it’s not a class!) through the basics of making their first Scratch program, and sharing it on the Scratch website. I really underestimated how excited they would be about this, but they loved the idea that their family and friends would be able to play the games they made. Then the project sheets (I try not to call them work sheets) are handed out, and the children make their first game. From what I’ve read of other clubs, a project usually takes a session or more, but our club seems to be haring through them more quickly than that. The children have done some Scratch before in their ICT classes, so they have a head start. I’m preparing a few projects ahead, to make sure I’m ready when they’re ready. I’ve found it useful to run through the projects myself before going into the club. The introductory walk-through only works on the website if you add in a ‘when green flag clicked block’ to your project, so we did that, and I found it useful to have a rough idea of what the scripts do in the game projects when I’m asked questions in a session. My experience writing Scratch Programming in Easy Steps has been useful because I can quickly spot some common problems (such as variables that are for all sprites when they should be for one, and vice versa). Newcomers to Scratch might benefit by preparing several sessions ahead or learning enough to make their own game, so they can spot common pitfalls more easily, but the most common problems I’ve seen come from not copying the scripts correctly, or not putting them in the right place. A quick check of the project sheet can quickly clear them up. The enthusiasm in the group is wonderful. It’s particularly nice to see them experimenting, and changing the sprites and backgrounds, and in time I hope they’ll start to experiment with the code more too. Some of them rush through it, perhaps trying to finish it first, looking mainly at the scripts in the project sheet, while others work more slowly, reading all the instructions, and often helping each other out. As I go round the room, I talk to them about how the scripts work, too, and explain things like what a variable is to help them understand why it’s not working as they expect sometimes…. Read more about his experiences putting together code club on his blog here. 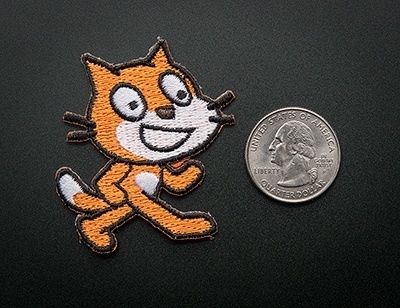 Award Yourself A Scratch Skill Badge!